Other application level package formats like gem, npm, phar, wheel etc. These files (packages) are often maintained in corresponding package repositories. Such packages may be specified as materials for GoCD pipelines. 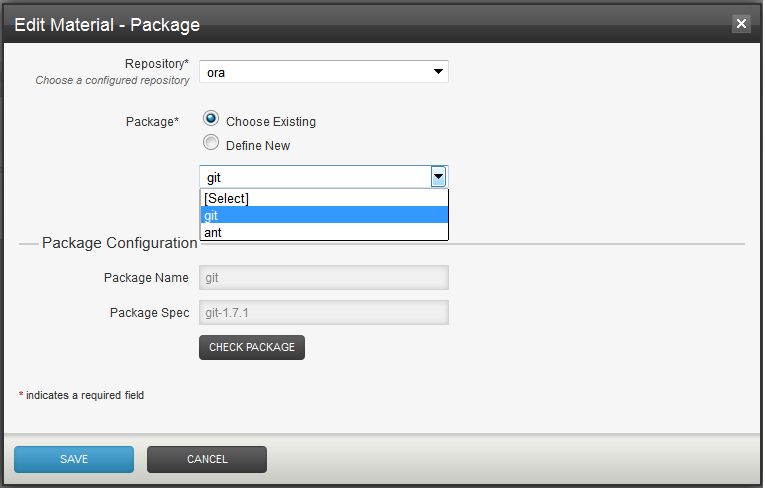 Since there are many package formats each with its own package manager and repository, the support for package-as-material has been implemented as an extension point. Using the bundled yum-repo-poller plugin, it is possible to specify an rpm package held in a yum repository as a material for a GoCD pipeline. Using other external plugins, it is possible to do the same for other types of packages. A repository may contain one or more packages. A pipeline may refer to a package as a material. When the package is updated in the repository, interested pipelines will get scheduled. 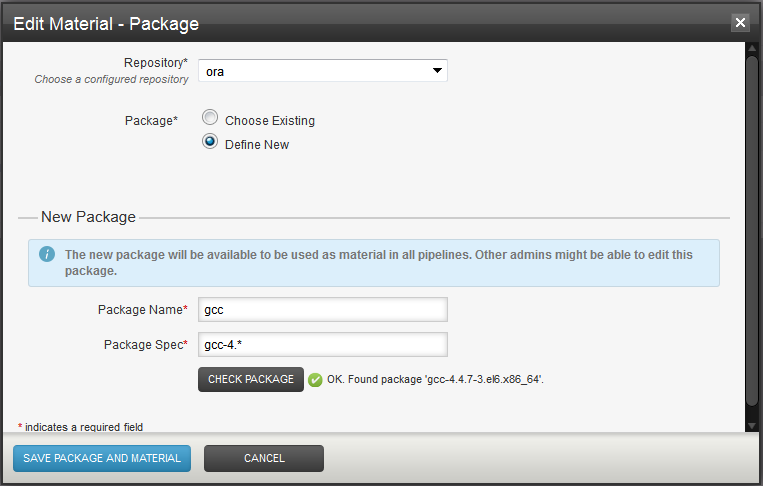 A package material plugin lets pipeline group admins provide details of the corresponding repository type to GoCD. e.g. 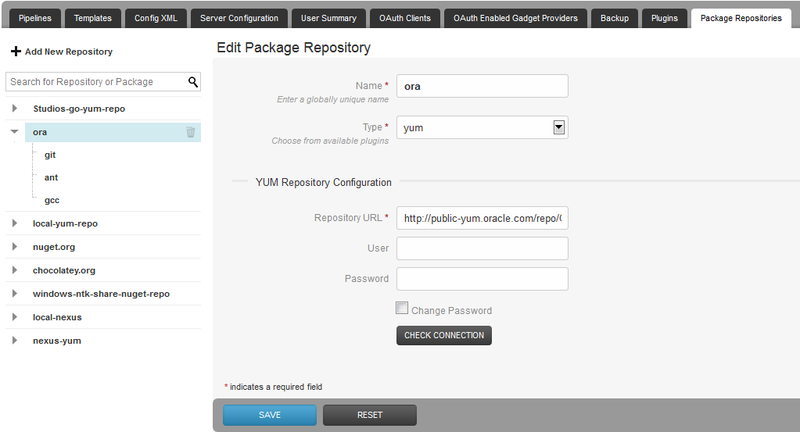 here is how we define a yum repository using the bundled yum-repo-poller plugin. The repository name is not used by the package material plugin - it is used by Go to construct the material name. Two package repositories cannot have the same name. Use the check connection button to ensure that Go can work with this repository. A package material plugin also lets you define packages at the time of pipeline material configuration (Admin > Material >Add Material > Package). Here is what it looks like for defining RPM packages with the bundled yum plugin. The package name is not used by the package material plugin - it is used by Go to construct the material name. Two packages in a repository cannot have the same name. Use the check package button to ensure that the package definition does indeed resolve to the package you are looking for. Unlike other VCS/SCM materials, the material definition in case of packages is not contained within the pipeline definition. Many pipelines may have material definitions referring to the same package. Here is how we associate an existing package as material for a pipeline. Each package definition must resolve to exactly one package on the repository, else the pipeline will not run. In order to set up a pipeline that polls for multiple packages, configure each package as a separate material. Here is a XML view of an RPM package definition. Note the relation between repository, package and pipeline material. Loosely typed property, key and value tags are used for repository and package configuration in order to accommodate different plugins. If you choose to configure via direct XML edit, note that it isn’t necessary to provide repository and package IDs, Go server will autogenerate them. However, not all validations that are performed while configuring via UI kick in while configuring via XML edit - the resulting failures will show up later in the server health message panel at the bottom right of the browser frame. Depending on whether GoCD is also publishing the package or just consuming it, there are two options for modeling a value stream that includes packages. Pipeline dependency: X becomes a material for Y. Y resolves the exact version of P and downloads it on its own (although this tip may be used to pass package version information from X to Y). X will appear as an upstream component of Y in the value stream map. Package material: Y adds P as a package material. Y no longer has to resolve P.
It isn’t advisable to do both as Y will then schedule twice. The choice depends on how closely the activities in pipeline X and Y are related. If it is important to see X and Y together in the same value stream map, then option #1 makes sense. The second scenario is where GoCD does not know about how/who published the package. Perhaps it got published by a job in Jenkins. Or perhaps the package is an open source package on a public repository on the internet. In this case the only option is to use a package material. GoCD helps you trace back to the external origin of the package if the package creator adds trackback information to the package metadata. The details of this will vary by plugin. In case of the bundled yum plugin, we use the URL field in rpm metadata for this. Repositories and their packages are global entities not tied to a pipeline group or environment. Pipeline group admins may define repositories and packages for use in their pipelines. One pipeline group admin may also use packages defined by another for their pipelines. Changing a package definition will cause all dependent pipelines to schedule - even those not in the same pipeline group as that of the person editing. Because of this, we don’t have a UI way of changing the definition of a package. Only the GoCD admin can change it via Admin > Config XML tab. Even if no pipelines use a package, GoCD polls for newer packages every minute. This may be turned off at a package level by setting autoUpdate to false via the config xml (GoCD admins only). autoUpdate is turned on by default. When a newer package is found, the pipelines for which it is a material get scheduled (assuming auto scheduling of pipelines is on). Also see API scheduling. Trackback URL - Typically an absolute URL that indicates what job (in GoCD or otherwise) created the package. At the time of building the package, it is recommended to include as much of the above information as possible so that it is available for Go to display as below. Important: Please note that if you change repository credentials and then try to re-trigger (redeploy) an old package, the published environment variables will not reflect new credentials. You could also explore the command repository on GitHub for helpful commands. What is command repository? Please see this. do the resolution of componentB for you.